“저희가 대출해주는 대상자들이 제일 많이 하는 얘기가, ‘날 어떻게 믿고 돈을 빌려주느냐? !’예요.” 2006년 사회연대은행에 입사한 김영숙 수석팀장은 주로 주류 금융권에서 소외된 취약계층 및 ‘신용 불량자’를 만나고 심사한다. 쉽게 말하면 서류상 ‘나쁨’으로 나온 숫자 뒤의 사람을 평가하는 일이다. 그들이 돈을 갚을 역량이 있는지, 대출금으로 자립할 역량이 있는지 등을 본다. 2003년 IMF 이후의 대안금융과 경제적 자립에 대해 고민하며 탄생한 사회연대은행은 주류 금융권에서 고개를 갸우뚱할 만한 거래를 주로 한다. 신용등급이 7등급 이하인 시민들, 금융 거래 내역이 없다시피 한 저소득 취약계층에게 낮은 이자율로 무담보, 무보증 대출을 해준다. 일반 은행에서는 대출받기 어려운 시민들에게 금융에 대한 접근성을 높여 주는 것이다. 일반 금융권에서 개인의 신용점수는 금융거래 내역으로 매겨진다. 사회연대은행에서 14년간 재직 중인 안준상 본부장은 “한국은 특이하게 신용점수가 등급화되어 있어요. 금융 거래 내역이 별로 없는 분들이나 거래 내역이 ‘나쁨’으로 나온 분들은 낮은 등급으로 인해 금융권의 대출 대상에서 소외됩니다.”라고 말한다. 국내 대표적 개인 신용평가 회사인 KCB에 따르면, 4,600만여 명의 국민이 신용평점으로 인해 등급화되고 있다(2017년 말 기준). 190만여 명의 7등급자 중 채무를 이행하지 않는 경우는 8% 미만이다. 92%는 채무를 이행하는데도 불구하고 좋은 대출 상품의 혜택(예: 낮은 이자율)을 누리기 어렵다는 말이다. 안 본부장은 “저희가 의문을 가졌던 부분이에요.”라고 말한다. 가난하다고 돈을 갚지 못하는 건 아니다: 이러한 사회연대은행의 핵심 전제를 바탕으로 하는 ‘마이크로크레딧’이란 개념은 1983년 무하마드 유누스가 방글라데시에 그라민은행을 설립한 후 전 세계적으로 퍼진 대안금융 운동이다. 소액의 대출을 통해 금융 소외계층이 일자리를 통한 자립에 필요한 자금을 마련해준다. 금융 접근성도 인권이라는 신념으로 시작한다. 대출을 받는 소상공인들은 보통 2〜3주의 심사를 거친다(일반 은행은 보통 1주 미만). 부채 상환율은 80% 정도다. 상환하지 못한 극소수의 경우 소송으로 번지는 경우도 있지만 연대은행은 되도록이면 기다려준다. 10년 넘도록 1년에 5만 원씩 갚는 고객도 있다. 안 본부장은 “사실 비효율적이죠. 기업의 눈이나 은행의 눈으로 볼 때 저희는 문을 닫아야 하는 지경이죠. 비효율적이지만 필요한 방식입니다. 사회연대은행은 사람을 보고 그분과 자립을 함께 만들어갑니다.”라고 말한다. 2016년 구글 임팩트 챌린지에 지원할 당시 사회연대은행은 이미 안정적인 기부금 모델로 13년 간 운영되고 있었다. 하지만 구글로 인해 조직은 새로운 전환점을 맞이했다. 지금까지 실천해 오던 대안적인 평가 방식을 더욱 체계적이고 광범위한 모형으로 구축하기 시작한 것이다. 구글에 지원한 프로젝트는 ‘대안 신용 평가 플랫폼’의 개발이다. 사회연대은행의 모든 회원이 사용할 앱을 개발하고 사용자 정보를 바탕으로 금융 데이터뿐만 아니라 비금융적 데이터도 축적하는 것이다. 이 모든 데이터는 한 사람을 ㅡ 기존의 신용 등급 이외에 최대한 다방면으로 ㅡ 평가하는 대안적 신용평가 모델을 구축하는 데에 쓰인다. 지원을 계기로 업계 다양한 이해 관계자와 연결하고 간담회를 열었으며, 지원금 2억 5천만 원이 확정된 이후에는 변호사 자문 등 구글의 지원 활동 덕에 작업이 수월해졌다. 안 본부장에 따르면, 구글 덕분에 멈출 수 없는 걸 진행하게 되었다고 한다. 개발 비용이 많이 들기에 구글 이외의 지원도 받았다. 미국 씨티재단(Citi Foundation)에서 플랫폼을 완성할 2억 원의 자금을 추가로 받아 2018년 1월에 앱을 출시했다. 이렇게 추가적 자금을 받는 데에 ‘구글 지원팀’이란 이력도 한몫했다. 10월부터 신용카드사회공헌위원회에서 1억 원 정도의 긴급 자금을 받은 후 고객들에게 대출을 시작하고 앱을 실질적으로 사용하였다. 사회연대은행 앱에 탑재된 새로운 ‘대안 신용평가’ 모형은 구글의 지원 후 연대은행이 구축하기 시작한 총체적인 평가 시스템의 한 가닥이다. 이 포괄적인 시스템에는 1) 주류 금융권에서 사용되는 KCB 신용평가의 점수, 2) 렌도와 함께 개발한 한국형 대안 신용평가 모형의 점수, 3) 기존 사회연대은행의 평가 방식을 더욱 객관화한 자체적 신용평가 점수를 기반으로 한다. 구글 플레이에서 100회 남짓한 다운로드 수를 보이고 있다. 많은 고객은 여전히 ‘옛날 방식’인 전화나 우편으로 은행과 소통한다. 지난 2년간 진행된, 연대은행의 새로운 시도가 ‘어떤 구체적인 변화를 야기했느냐’에 대해 평가하기는 아직 시기상조인 것 같다. 하지만 ‘대안 신용평가’라는 용어가 금융권에 이슈화되고 있는 것은 분명하다. 2018년 11월 국회에서 더불어민주당 김병욱 의원이 발의한 신용정보법 개정안에는 대안 신용평가에 대해 언급한 내용도 있다. 금융적 정보와 비금융적 정보를 통해 개인의 신용을 평가하는 전문 개인 신용평가 회사를 도입하자는 제안이다. 사회연대은행의 대안 신용평가 실험들은 거대한 사회적 부를 창출하지는 않는다. 대출이 필요한 우리나라 저소득 취약계층 인구로만 본다면 아직 규모가 그리 큰 편도 아니다. 하지만 “금융 접근성도 인권이다”라는 아직 보편화되지 않은 인식을 앞장서서 사회에 알리고 있다. 앞으로 연대은행 사람들의 목표는 그들이 만들어가는 대안적 신용평가가 다른 신용사에서도 더욱 널리 인정받는 것이다. 그들은 지금의 모습이 아닌 앞으로 몇 년 후의 변화를 눈여겨 보라고 말한다. “One of the things we hear most often from our borrowers is, ‘How can you trust me enough to lend me this money? !’” Young-sook Kim’s job at Social Solidarity Bank (SSB) is meeting people excluded from mainstream finance, including those labeled as ‘delinquents.’ She assesses their ability to pay back the loan and judges the person beyond the low credit score. “One young man [in his twenties] from Busan was awarded a student loan from SSB. He had a lot of debt in his name, because he was trying to pay back his mother’s debts. He couldn’t borrow money from regular banks and came to us. After we lent him the money, he came all the way up to Seoul to meet us in gratitude. ‘I wanted to know what the heck you guys looked like,’ he said,” remembers Kim, the senior manager of SSB’s microcredit team. 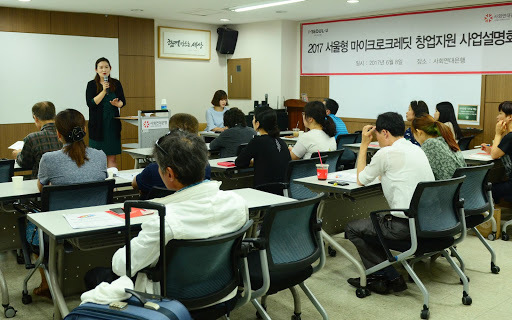 Social Solidarity Bank was created in 2003, a few years after the Asian Financial Crisis of the late 1990s hit South Korea in one of its worst economic disasters in modern history. The founders of SSB were concerned with alternative modes of finance; in trying to help citizens escape poverty, SSB often engages in trade that would raise the eyebrows of those working in mainstream financial institutions. SSB gives out unsecured loans to citizens with credit levels below seven, people without verifiable records of financial transactions and others unable to borrow from regular banks. According to KCB, one of the country’s foremost credit assessment firms, around 46 million South Koreans (out of around 51 million) were classified into credit levels as of 2017. Among the 1.9 million citizens in the lower level seven, less than 8% didn’t pay back their debts. That means 92%, despite paying back their loans, most likely couldn’t qualify for the benefits of a good loan package, e.g. one with a lower interest rate. “These numbers make us skeptical,” says Ahn. SSB is based on the idea that access to finance is also a human right, that an individual’s poverty doesn’t necessarily indicate delinquency. The organization embodies the concept of ‘microcredit,’ which is a global movement founded by Muhammad Yunus, who established the Grameen Bank in Bangladesh in 1983. The Grameen Bank also established the first microcredit organization in South Korea, Joyful Union, which launched not long before SSB began. Typically, a small business owner applying for a microcredit loan undergoes two to three weeks of SSB assessment -- this is significantly longer than a regular bank, which usually concludes its assessment within a week. 80% of SSB’s microcredit clients pay back their loans. It’s very rare that delinquencies lead to lawsuits, because SSB opts to wait. There has even been a debtor that paid back 50,000 won (around $45) a year for ten years. When SSB was selected in Google Impact Challenge (GIC) 2016, the organization was already operating on a stable donation model for 13 years. But Google brought about a fresh turning point for the company. The funding triggered the beginning of a massive project to create more comprehensive and diverse systems of alternative credit assessment (ACA). Google supported SSB’s vision with its funding of 250 million won (over $200,000) as well as free consultations from lawyers. Thanks to Google, says Ahn, “We started something we just can’t stop now.” The specific Google project, developing an ACA app, is but the tip of an iceberg. The app aims to create a database based on the various -- not just financial -- activities of its users. The database will then be used to judge an individual in multiple, nuanced ways, in addition to the pre-existing credit scores used by most other financial institutions in Korea. Development fees exceeded the budget provided by Google, so with Google’s assistance, SSB received an additional 200 million won from the Citi Foundation in the U.S. In January 2018, the app was finally launched, but wasn’t put to proper use until October, after the Credit Card Social Contribution Committee gave SSB around 100 million won as its starting microcredit budget for the app. The new ACA model embedded within the app is a part of a larger, comprehensive assessment system that SSB is building. Within this system, there is 1) the credit scores used by mainstream financial institutions like the Korea Credit Bureau; 2) the scores from the ACA model developed by SSB and Lenddo Korea; 3) the scores from SSB’s pre-existing assessment system, albeit more upgraded. It's still early to judge how impactful the nonprofit’s original GIC vision has been, since everything is still in its initial, testing stages. Currently the app has been downloaded around 100 times on Google Play, available to Android users. Most of SSB’s clients still use the ‘old way’ of telephoning or mailing their information. It’s clear that the phrase ‘alternative credit assessment’ is becoming more visible in South Korea. In November 2018, the phrase was included in a recent bill in the National Assembly, proposing changes to the existing credit information law. Basically, the bill emphasizes the need to create a specialized assessment firm that would look at an individual’s non-financial data, in addition to the given credit scores.